Thanks scottminimum! I had to stop for a couple of days because I had some travel and other commitments. 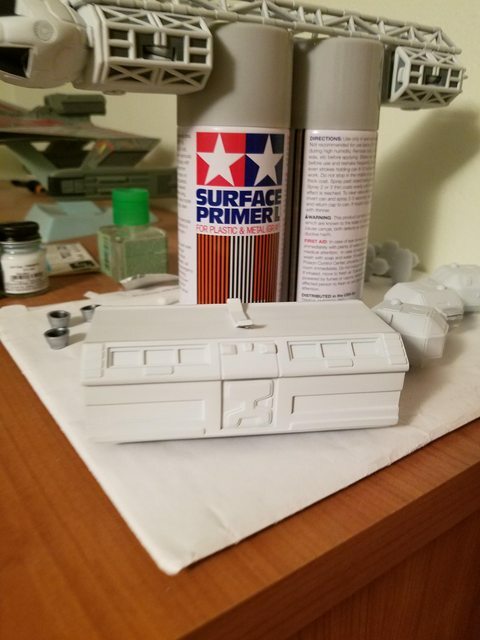 I painted the base coat on the passenger pod and found I to do a little more filling and sanding. 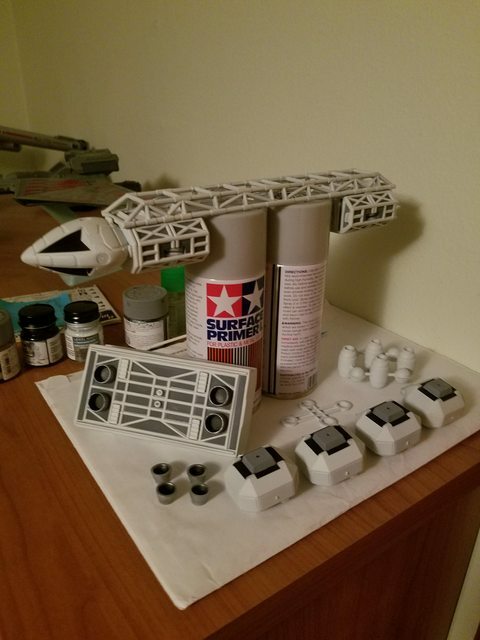 I'm hoping to put fresh base coat on either today or tomorrow and then decide whether I am going to do the red stripes or not. Hey starsiegepalyer. 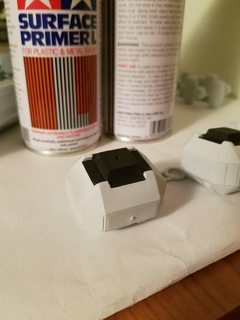 I am hoping it will have the right look after they're painted. I have to wait on that though. I bought the Paragrafix photo etch set for the sensors on the command module and the diffusers on the rocket motors. Well, I messed the diffusers up trying to install them and now I am waiting for a replacement set. They should be here in a few days and then I should have an update after that. I was able to make some progress this weekend. 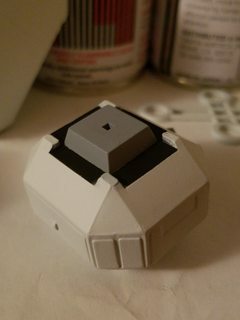 I painted the base coat on the passenger pod and then removed the masks underneath. After a little touch up I think it turned out really nice and I am pleased with the results. I hope to have a little more progress in the next couple of days. Keep going! It's looking awesome! Thanks a lot Steve I really appreciate that! I would like to take all of the credit but, I have to give it to Aztek Dummy and their mask set. With a little trimming and adjustment they are really incredible. I did have to do a little touch up in a couple of spots where they weren't firmly pressed down. I finally have my replacement parts from Paragrafix so I hope to have the engines done sometime this weekend. Looking incredible. Always in awe of how people accomplish the seeming impossible with paint. Your paint masking on the bottom of the cargo module is fantastic. Love the look. Thanks scottminimum and modelerdave! I wish I could take credit for the masking but, I bought the Aztek Dummy paint masks for this kit on Culttvman's website. I was making good progress when I took a step back yesterday. Painting one of the landing pods the painting kept lifting up when I removed the mask and I just have to put it down for a couple of days and rethink my strategy on this. A little frustrating but, I'll get past it eventually. The other three did not give me as many fits and turn out pretty nice. I'm hoping to get back at it and get this cleaned up in a day or two. I've decided I will not give up without a fight and repainted all of the damaged areas. I think I got it now and it looks pretty good. At least good enough that I think any more messing around will only have me looking for trouble. 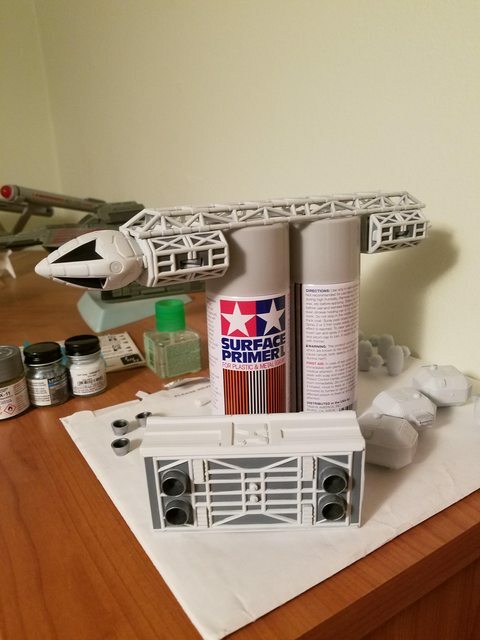 Now I just have to figure out how I will mask the center portion to paint it aluminum to simulate the landing gear mounting. If you are talking about the landing gear cage structure , it's grey. I see that you're right about the grey starsiegeplayer. 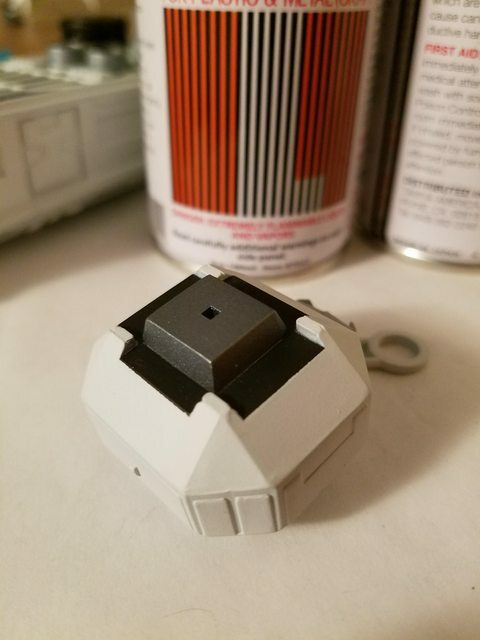 However, when I painted the aluminum over the black I got this muted dark grey metallic look that I kind of like and think I am going to stay with. 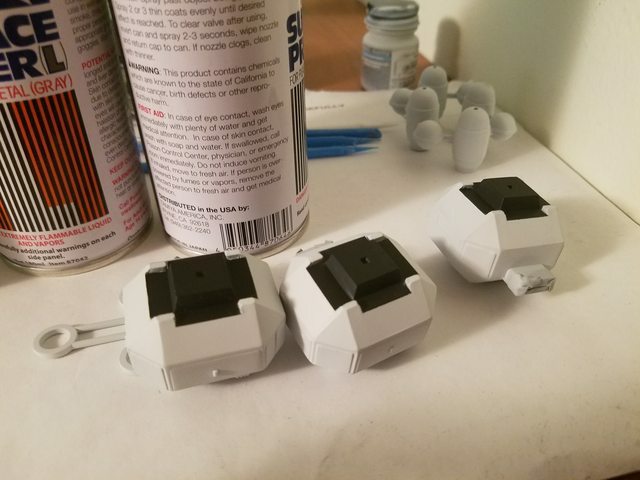 Besides these pods were such a masking nightmare for me as well as the problem with the tape lifting off the paint on the one pod, I am going to consider this a victory and move on. Yeah that metallic grey looks good! Thank you Sir!! I've been battling a cold the last couple of days so I haven't had much progress this week. I will pick it up again next week after I am feeling better. After thanking starsiegeplayer for liking my metallic color, I decided to make a change. 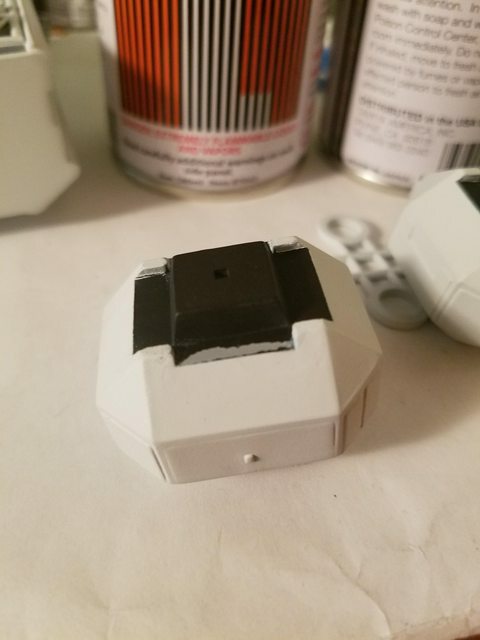 I have to admit after some serious consideration about what he originally said and being sick the last few days which gave me plenty of time, I went back and repainted the gear part of the landing pods dark ghost gray. Now it does look more accurate and the color does work. I do now see the light at the end of the tunnel and I hope to have more progress soon. 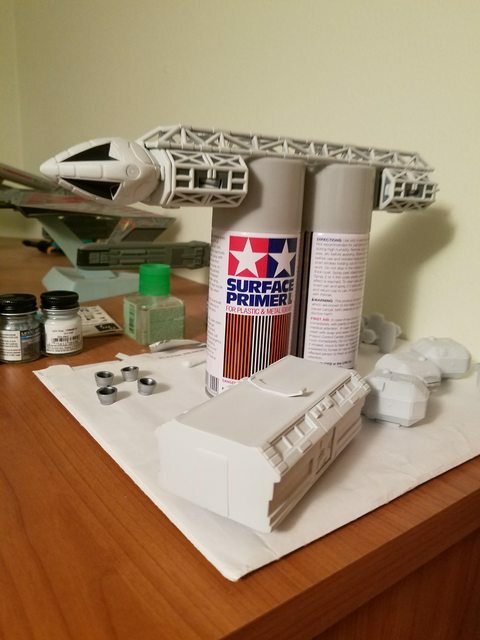 I didn't do much this week because I was debating about whether I was going to order more aftermarket parts for the engine bell diffusers and the RCS thrusters. I was looking on Shapeways and they have this pretty nice looking set. I bought the Paragrafix photo-etch set but, they are just too delicate and I need a lot more practice working with photo-etch. On another board someone recommended Shapeways and I liked what they have to offer. I wish I could have found out earlier because they have an awesome set of accurate landing gear. 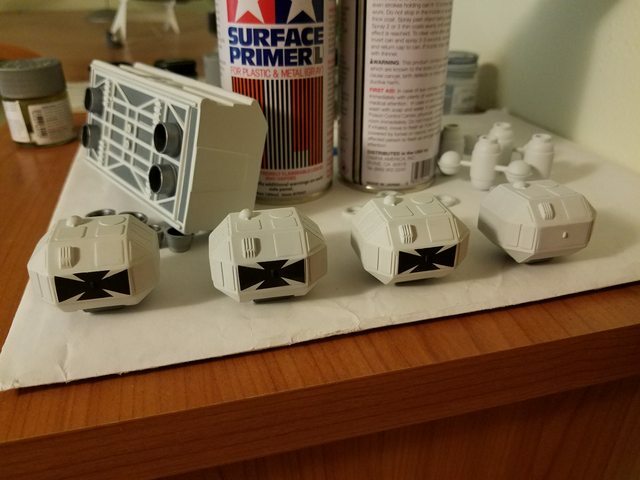 It's too late in the game to go back and do surgery on the shoulder pods and I want to get this done and get on to my next project. So while I wait I painted those what I call gothic crosses on the shoulder pods. I could have gone with the decals or the vinyl replacement that came with the Aztek Dummy masks, I wanted to do paint. Do I used the outline from the vinyl piece as a mask and it turned better than I had hoped. I have only three done because I discovered the fourth needed a little more filling and sanding so I will wait for that to dry another day before painting the last one. The paragraphix engine baffles are not too hard to work with if you put a spacer tube in to hold them (the filming model used a spacer tube also). Find a stock styrene tube and cut it so that it sits in th engine bell straight and the baffle can lay on top of it. You can sand the ends down if you cut them too long. When the test fits are good, cement the tubes in the engine bells and let them dry completely. Then, all you have to do is put ca glue on the ends of the tubes and lay the baffle pieces on top with tweezers.